Drew started his collegiate track career in his senior year of college at Central Methodist University as a multi athlete in the heptathlon and decathlon. 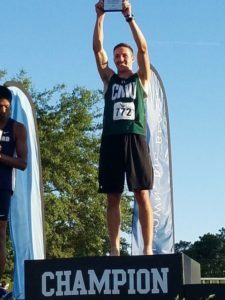 He qualified for the NAIA Outdoor National Championships his first year and finished 11th, leading him to come back for a 5th year of school where he won the national decathlon title in the spring of 2017. Drew is currently staying on at Central Methodist where he is continuing to train and act as a volunteer coach for the team while working on his Masters in Education with an emphasis in Athletic Administration. This year he hopes to qualify for the USATF indoor and outdoor championships and continue to get better in his events.